Paratrikes require the satisfaction of two mutually-exclusive conditions. On the one hand they need maximum static thrust for an easy start, which requires a large-diameter propeller, and on the other – compact size for ease of transportation, low center of gravity, propeller ground clearance . The optimum propeller diameter for high-powered paratrikes is 140 – 160 cm and 120 – 140 for the lightweight ones. You should also leave a gap of 5-8 cm between the propeller and the enclosing structure. All of this makes using propellers of over 160 – 165 cm very difficult. Once you have determined the power output of you engine, you must choose a propeller. Here the options are just as many, but it is very important to choose a particular manufacturer and particular propeller. If your engine and gearbox are standard, such as a ROTAX package for example, it would be easier to choose, because there are plenty of tried and tested configurations which limits the risk of making the wrong choice. However, if you decide to go the converted-engine route, choosing the right propeller becomes more complicated and it would make sense to use a ground-adjustable propeller because it gives you the opportunity to make adjustments as needed. 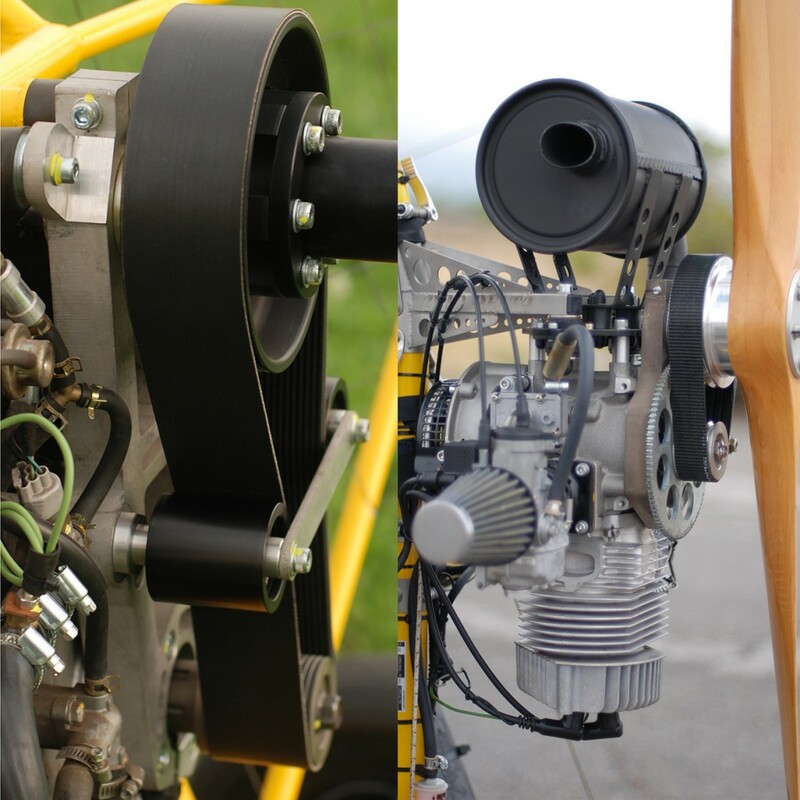 Once you have chosen an engine and a propeller, you must determine the type and the ratio of the reduction unit. We must mention here that selecting the right reduction ratio is essential for the smooth operation of your paratrike. Ratios close to even numbers must be avoided. For example, choosing a ratio in the interval 1.8 – 2.2 or 2.8 – 3.2 is not ideal because it will create frequency beating, a phenomenon well-described in multiple Internet sources. This has negative effect on the vibrations of the paratrike and should be avoided if possible. When you choose your ratio, you must be sure that the engine can reach and slightly exceed its full power RPM . 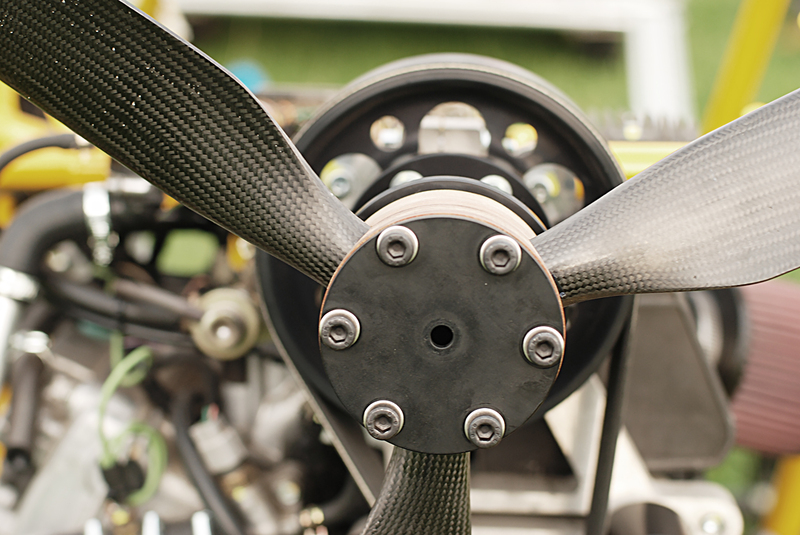 If you choose a heavy propeller (high-pitch propeller), this would typically create vibration issues within the engine-reduction-propeller system. When converting engines for aircraft duty, people tend to use various types of belt-driven reduction systems. The choice is determined by the power and RPM to be transferred, the diameters of the pulleys, and the center-to-center distance. Most of the major belt manufacturers have catalogues or software which makes it easier to select the right belt and pulley diameters. The propeller needs to be as far off the ground as possible. If the distance between the propeller and the ground is less than 25 centimeters, your paratrike will end up being a lawnmower. During rougher landings propeller blades often get damaged and in some cases the entire propeller gets broken. In other words, when it comes to the propeller – the higher, the better.